Computers, cell phones, passports, credit cards, ourselves. It’s hard to travel without bringing along a slew of expensive and important stuff. We carry these things through airports, on trains and buses, and in and out of hotels and rented apartments. 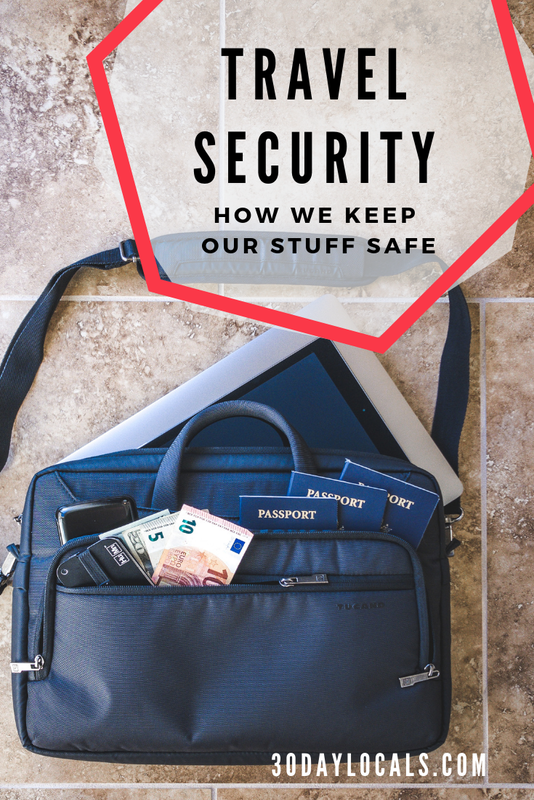 It’s impossible to keep them 100% secure, but here are some tips we’ve learned and some things we use to keep our stuff, and ourselves, safe when traveling. Let’s start by defining what kinds of threats we’re most concerned about when traveling. We don’t visit locations where we have any concern about personal safety. The destinations we choose tend to be generally very safe. This wasn’t always true, but it certainly is now that we have our daughter along for the ride. While it’s true that violent crime can happen anywhere, the traveling threats we’re most concerned about are petty and non-violent: bags getting swiped, pickpocketing, and scams. Keep this in mind when reading the following tips and tricks. It might seem counterintuitive, but when traveling to a destination, I like to put all the most important stuff in one bag. This includes our 2 computers, an iPad, passports, credit cards, and cash. With everything in one bag, I can keep most of my attention on that bag. This bag stays on me at all times. I put it at my feet on trains, planes, buses, and in taxi cabs. The only way we’re losing this bag is if someone puts a gun to me and kindly requests that I hand it over. And again, we don’t generally find ourselves in those kinds of places. I use a laptop bag like this one. It’s big enough to fit 2 computers and the iPad, and the passports and credit cards can go in the outside pocket. If you’re not traveling with computers, you might prefer a shoulder bag like this one. It’s big enough to fit an iPad and all the things you’ll need on the actual travel day. Plus, you can use it as your daypack when sightseeing at your destination. For the super paranoid (myself included :), you might want to throw a tracking device in your “One Bag”. We have both a Tile and a Jiobit in ours. The Tile is great for shorter distances and can even work over longer distances if those around your missing goods happen to be running the Tile app. You can use the app to track down a missing bag and then trigger the sound to (hopefully) identify its location. Jiobit is a tracking device marketed toward families with children. It uses all sorts of technologies to be able to track down whatever it’s physically connected to anywhere in the world (in addition to the Bluetooth the Tile uses, Jiobit also connects to cell towers to work over much longer distances). We put ours on our daughter if we’re at a large playground or plan to be in large crowds of people. It’s kind of like a leash without being a leash :) But because she’s always right at our side when traveling between destinations, I put the Jiobit in our “One Bag”. Besides yourselves, your passports are probably the most important thing to protect when traveling. The first thing to do is to make photocopies of your passports. Leave these copies with someone you trust like a parent. If you ever lose your passport for any reason, the person holding the copy can take a photo or scan the photocopy and email it to you. When we’re moving between destinations, as I’ve said I’ll put our passports in the “One Bag”. When we arrive at our destination, what I do with the passports depends on where we’re staying. If we’re in a hotel, I’ll put the passports in the hotel safe. It isn’t the most secure location as plenty of people will have a key to that safe. But at least it keeps the passport out of the hands of anyone random entering the room. If we’re staying in an AirBnB, I’ll often try to get tricky and find a place to hide the passports that someone rifling through our things quickly won’t likely see. This could be between a stack of towels in the linen closet. It could be up high in a random cupboard. Or it might be in a decorative jar or vase on a shelf. We’re encountering more and more AirBnBs that are actually providing safes, so definitely use those if it’s an option. Again, someone will have the key, but you’re at least limiting the number of people with access. The passports will stay wherever they’re stored unless we need them to rent a car. Does anyone go anywhere without a credit card these days? (Well, the Germans do, but that’s for another post.) We travel with a few different cards to earn airline miles strategically. As with your passports, the first thing to do is to make photocopies of your credit card(s). Leave these copies with someone you trust like a parent. If you ever lose your card(s) for any reason, the person holding the copy can take a photo or scan the photocopy and email it to you. You’ve probably heard that credit cards contain technology (RFID) that allows them to be read with “skimming” devices. It’s arguably more of a scare tactic to sell wallets than an actual threat, but I’ve found this RFID protector useful if for no other reason than to keep my cards organized. And it’s cheap. I put any cards I’m not using on a daily basis in this wallet and toss it in the “One Bag” when traveling. My daily use wallet also happens to be an RFID protector, but I’d like it even if it didn’t include that feature. When I’m feeling a little more concerned about what we’re doing or where we’re going, I’ll create a “decoy wallet”. Basically, I put a few old credit cards that have been cancelled and a little bit of cash in the wallet in my right front pocket with my cell phone. Then I’ll put my actual cards and cash in my left front pocket where I normally keep my wallet (I used to keep it in my back pocket, but that’s just inviting pickpockets). If we were to be held up, I’d reach for my right pocket and hand over my cell phone and fake wallet. Someone holding you up is always going to expect a cell phone, so your best option for keeping that safe is to carry an old cell phone as a decoy. I don’t actually do this, but it’s certainly an option. The days of carrying lots of cash or converting cash immediately upon arrival at your destination are over. We carry as little cash on us as possible and RARELY use currency exchanges. You just never know if you’re getting a good deal or getting completely ripped off. How do we avoid currency exchanges? We use the Charles Schwab Investor Account with debit card. ATM machines are everywhere, and by using them, we can always be sure we’re getting the best exchange rate. Furthermore, Schwab will refund any ATM fees you incur. How awesome is that?! In addition to this Schwab account, we keep the bulk of our cash in a separate Schwab account that has a debit card we don’t carry with us. We’ll then transfer funds periodically as we need to. This way, if someone steals our daily use debit card, they’re only able to get as much cash as we have in that account at the time. ATM machines have gotten a lot of press recently as hotspots for debit card data theft. There are 2 ways to protect yourselves from this kind of theft. 1) Use ATMs off the beaten path and inside a bank. Machines outside and located in tourist areas are more likely targets for thieves. 2) Before putting your card in, try to remove the part that takes the actual card. This is where a thief would install a dummy device so jiggle it forcefully to be sure it doesn’t come off. Pickpocketing is actually fairly simple to avoid. Don’t wear fancy jewelry that will draw attention. Keep your valuables in your front pockets. And be sure the bag you’re carrying is either on your front or has a secure zipper. In all our travels, we’ve been lucky enough to avoid falling for any scams. Having lived in a number of big cities, our BS detectors are fairly tuned and we’ve learned to mostly ignore people trying to talk to us on the street (even children). The most important thing to remember: it’s okay to say “NO” or just to completely ignore anybody. You don’t owe anything to anyone no matter how sad and needy they look. When we were in Lake Atitlan, Guatemala, we encountered children who would boast of some ancient wonder they wanted to show us. For just a few dollars, they’ll bring you straight to this unbelievable site. In reality, they’ll take you to some back alley where their much larger friends will shake you down for more money. Do these people need the money more than you? Yes. Is it your responsibility to help them? Absolutely not. If you’re feeling generous, donate to a reputable aid organization like Doctors Without Borders. Many larger cities have taxi apps that work just like Uber. So, if the city doesn’t have Uber, or you just don’t want to use Uber, download a taxi app first. By using the app, you’re much more likely to get a reputable taxi to pick you up. In Europe, we’ve used Taxify, MyTaxi, Cabify, Liftago, and Uber. There are 3 aspects of computer security: the security of the physical computer, the security of the data on the computer, and the security of the information you pass to and from the websites you visit. Protecting your actual computer is probably not much different from protecting anything else important you’re traveling with. I keep the computer(s) in the “One Bag” that stays on me at all times. At our destination, I’ll often store the computer in some out of the way place that a thief in a hurry won’t likely see. Like the passports, the computer(s) might end up between towels in the linen closet, or up high in a hard to reach cupboard. If you’re more concerned when traveling to and from destinations, put your laptop in a bag that isn’t a laptop bag. This bag is one of our favorites for carrying 1 person’s things and as a bonus it has a somewhat hidden laptop compartment. At least this way it won’t be obvious you’re carrying a laptop. The downside here is that you can’t very well store this bag at your feet on planes, trains, and buses. To maintain the security of the data on the computer, I try to store as little on the actual computer as possible. Instead, I keep everything on a thumb drive that I backup to the cloud regularly (we use Google One). When on the move, I keep the thumb drive in that little pocket in my jeans that nobody ever uses (never thought you’d find a use for that, did you?). When at our destination, the thumb drive will be hidden along with the passports. It’s also incredibly important to use a password manager like 1Password. 1Password allows you to use crazy passwords you’d never remember and are much less likely to be hacked like “ZaLaG2ea*$RrLG”. You only need to remember the passphrase you setup to unlock access to your passwords (which should be a decent length sentence and not just a simple password). When browsing the web, always be sure you’re connecting to a site over HTTPS. In a browser like Google Chrome, you should always see 2 things: 1) the word “Secure” in green next to the address of the site you’re visiting (or the name of the business if they have an extra special SSL certificate) and 2) the address of the site should also always begin with “https”. Don’t use sketchy wifi connections. We recently had a few hours to kill at the airport in Split, Croatia. I turned on the wifi on my phone to see a wide open network called “Split Airport FREE”. This could very well have been a legit network, but it also could have been a fake network masquerading as legit to steal the data you pass between your phone and the sites you visit. When in doubt, it’s better to use what cell phone network connection you have than to connect to a sketchy network. Or just sit and twiddle your thumbs until it’s time to board the plane. We use and highly recommend a VPN. A VPN is a secure connection through which all your internet traffic will run. Nobody, including the internet service provider, will be able to see what exactly is going through that connection. As a bonus, connecting to a U.S. based server when traveling abroad will often allow you to bypass location restrictions on streaming services like Netflix. I’m a fan of NordVPN. We’ve been using it for about 6 months and it works great. The interfaces on their apps are nice as well. This one might seem a little out of left field. However, given the news not too long ago of the family who died in their sleep in Mexico due to a carbon monoxide leak, I’m going to file this one under “you can never be too safe”. We travel with this carbon monoxide detector. I remove 1 of the 3 batteries when traveling to our destination, and then replace it when we arrive. I’ll place the detector itself near the bedrooms, preferably a foot or 2 off the floor. Do you have any tips and tricks for traveling that we missed? Let us know in the comments. And be sure to pin this for future reference! Enter your email address to receive your FREE family vacation budget worksheet and itinerary planner. Thank you! Please check your email for your free worksheet.